Note: At import time, the system automatically modifies telephone numbers to normalize dots and dashes. If a telephone number has “tel:” prepended, that prefix is removed to ensure that the number is in the correct format for a Do Not Call list. Note: An error message appears if the new DNC list exceeds the maximum limit count of 1000. 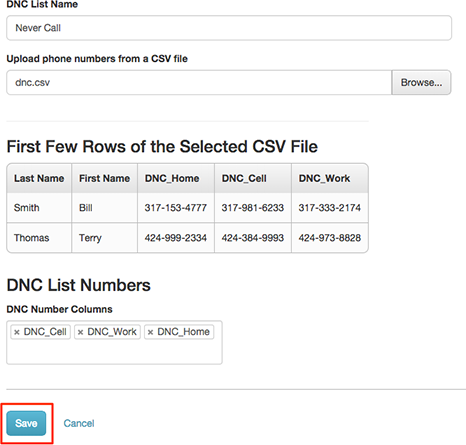 Delete old or obsolete DNC lists as needed and click Save again to complete the new DNC list configuration.